Whether you’ve been following my blog for a year or only a month, you probably know that we adore Veggie Tales. 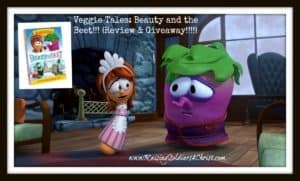 My kids were almost excited as I was when I was asked to review the newest Veggie Tale DVD! Beauty and the Beet is the latest installment from those crazy and beloved Vegetables. As winter is quickly approaching, this movie is a great lead-in with a lovely winter theme. Of course, we all know each VeggieTale movie is centered around a common theme, a character trait that is emphasized to help children learn and understand how to treat each other in a Christian way. The theme in Beauty and the Beet is Unconditional Love. I’m sure you’ve also noticed the title of this movie is a slight play on the Disney movie Beauty and the Beast. The creators and producers of VeggieTales movies do a wonderful job of mimicking the major titles that we grew up watching, but put their spin on character traits. The music in this movie is wonderful. The songs feature the voice of Kellie Pickler as Mirabelle – a sweet potato singer whose family is on the brink of becoming a star with their group “The VeggieTones!” She has a heart after God and tries to motivate others to show love even though Mr. Beet treats her poorly. Mirabelle exhibits all 9 of the Fruits of the Spirit. Some people seem to be unloveable and grouchy most of their lives, but they still need to be shown the love of Christ. Mirabelle is Christ-like teaching Mr. Beet to sing while being kind to him and doing things for him—even at his worst. Kellie Pickler sings 8 of the 10 songs on the DVD and her voice is absolutely beautiful! The music helps the viewer (even parents) relate to the theme of the movie in many ways. The songs and music about Jesus in this film are an added bonus! Of course, no VeggieTale movie is complete without “Silly Songs with Larry.” Even us adults find ourselves singing along to “Where is my hairbrush,” “His Cheeseburger,” and “My Lips.” Beauty and the Beet features a new silly song – “Mac and Cheese!” The new Silly Song is hilarious! This song was such a hit for my family, especially since two of my three boys would survive on Mac & Cheese alone if I allowed them..LOL! We have a lot to look forward to this fall from VeggieTales. Beginning November 26th, a VeggieTale series will be featured on Netflix!! The series is called “VeggieTales in the House.” You can view a clip by going HERE. For my subscribers —– Click below to enter the Beauty and the Beet GIVEAWAY!! My family is very excited for this movie!